.I have been very fortunate in my life but I don't say this in a holier than thou way - frankly I have been damn lucky! First I have had some amazing and wonderful horses, few of which I have actively sought out and most of which have somehow found me. It has been these particular horses which have most helped me to help others. Second, certain people have been incredibly kind and many doors have opened for me when perhaps I didn't deserve them very much at the time. Nevertheless, I have tried to make up for this by using every opportunity to express and spread the word so that what I have learned the hard way can be made available and accessible to other people and other horses. The thing I loved about the Portuguese riders was how still, how quiet, how upright they rode. No heaving about or pushing! Just centred, and of course then the horse could balance around them and give whatever was asked. This is Dr Borba, the Portuguese chef d'equipe who was to become a dear and valued friend who stayed at our home in Suffolk several times. Writing has always been in my blood, as long as I can remember. Perhaps because I used to be quite a shy person, I found I could express myself better on paper. You can say so much more! You can stir the imagination...You can move mountains.... You can change the world.... for better or for worse (look at Dante! look at Hitler! ....) The word is powerful. 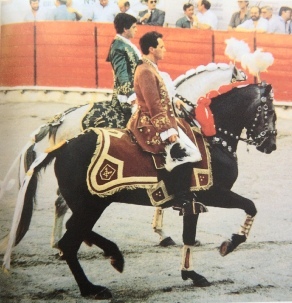 I realised that long before the publication of my first book The Royal Horse of Europe, dedicated to the horses of Spain and Portugal and explaining how the thoroughbred and many other breeds evolved. Going to Portugal in the late 1960s seemed at the time by chance; now I know it wasn't. I had tried to go away from horses, but I was hauled back. I found a people so well versed in the art of horsemanship that the riding took my breath away. It also challenged me hugely, because it was so different from all we'd been taught. 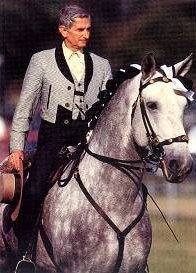 The story of my quest to learn and improve is well documented in my book The Classical Rider. One of the most important things I learned in Spain and Portugal was how to move in a good posture. Moving well, dancing well, riding well - with a proud, open posture puts you in balance with your body. You breathe better, the brain functions better, imagination grows and so does confidence and stature. No wonder the old masters taught that the classical art of riding ennobled the man! Deeply concentrating, straight as an arrow, the classical rider makes his final salute after a display of Lusitano Horses at Addington. 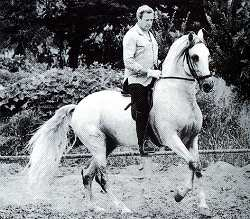 Here Maestro Joao de Portugal Trigueiros de Aragao demonstrates total oneness with the horse. 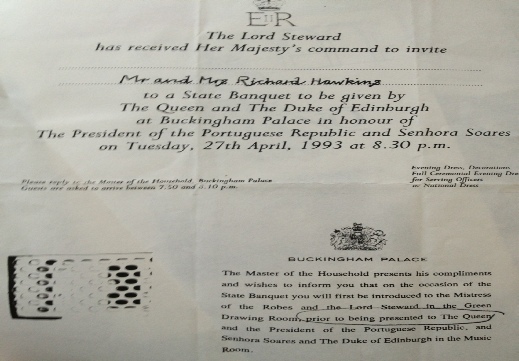 This invitation came as a result of Sylvia’s work for Portugal and the Portuguese Horse. The Mrs. Hawkins refers to Sylvia’s second marriage name.